A party of committee members, together with Dr Arnold Loxam, journeyed to Durham to assess the instrument’s possibilities. Shortly after, a bid was made and accepted to buy the instrument and transport it back to Harworth, North Nottingham. This was done over two weekends, working through the night after the film had finished. One weekend the driver even made two journeys back and forth to Durham, covering approximately 400 miles in total. 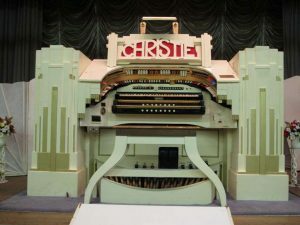 The Christie was refurbished in the old wages office at the colliery, before being installed in the Welfare Hall during the summer of 1973. On the 30th September 1973 it was opened to the public for the first time, in front of an audience of 500, featuring Robin Richmond and David Hamilton as organists. As time progressed, Dr Arnold Loxam was to become President, with David Hamilton as Vice President. By 1977, the Society had purchased a lift for the organ from a cinema in Stratford, London and this was installed in complete secrecy after the November concert and in time for the Christmas Concert in December 1977. Obviously there was great delight when the organ appeared from below stage level for the very first time in the hands of Arnold Loxam. During those early years a club night was held on Tuesday evenings when members could come along and have a go on the Christie. It was from these club nights that youngsters such as Andrew Nix, David Redfern, Philip Randles and Joanne Naulls took their first steps on the road to fame within the organ world. Since these early beginnings a third keyboard has been added, along with a Diaphone, Trumpet, Krumhorn, String Celeste and Xylophone and a Phantom Piano on stage. Approximately three thousand pounds was spent about ten years ago on stage lighting which is now claimed to be one of the best stage set-ups to be found anywhere in the organ world. The society hold ten concerts and six dances between September and June, these being always on the forth weekend of each month. Free secure car parking is available to the rear of the hall.